The cool weather is here and winter is right around the corner. 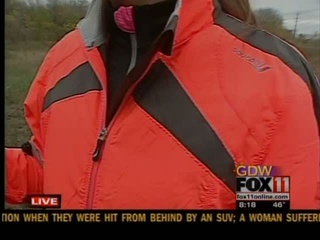 FOX 11's Emily Deem stopped by Fleet Feet Sports in Appleton last spring to find some helpful tips. Watch the videos! Dress in layers - Start with a thin layer of synthetic material such as polypropylene, which wicks sweat from your body. Stay away from cotton because it holds the moisture and will keep you wet. An outer, breathable layer of nylon or Gore-Tex will help protect you against wind and precipitation, while still letting out heat and moisture to prevent overheating and chilling. If it's really cold out, you'll need a middle layer, such as polar fleece, for added insulation. Protect your hands and feet - As much as 30% of your body heat escapes through your hands and feet. On mild days, wear running gloves that wick moisture away. Mittens are a better choice on colder days because your fingers will share their body heat. Add a wicking sock liner under a warm polar fleece or wool sock, but make sure you have enough room in your running shoes to accommodate these thicker socks. Do not overdress (10 degree rule) - You're going to warm up once you get moving, so you should feel a bit chilly when you start your run. A good rule: dress as if it's 10-20 degrees warmer outside than it really is. Stay Hydrated - Despite the cold weather, you'll still heat up and lose fluids through sweat. Cold air also has a drying effect, which can increase the risk of dehydration. Make sure you drink water or a sports drink before, during, and after your run. Be Seen - With limited hours of daylight during the winter you may find yourself running in low light or dark. Reflective gear is an absolute must. Your options range from reflective belts and vests to high visibility apparel collections such as Saucony ViziPro, Brooks Nightlife. Many of our apparel items also have reflective panels.